Genetically modified organisms have had specific changes introduced into their DNA by genetic engineering techniques. 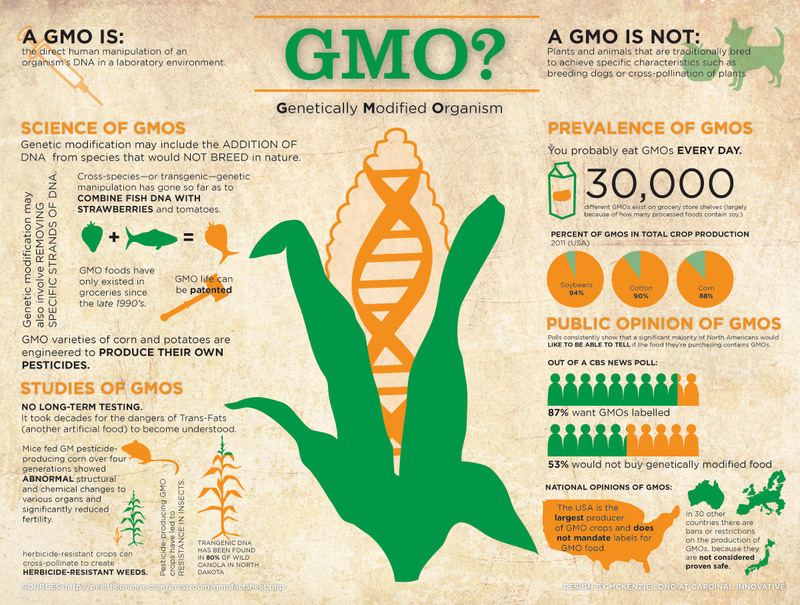 Common genetically modified foods include soybean, corn, canola, rice, and cotton seed oil. The genes of genetically modified foods are split with the E.coli bacteria, Bt toxin, and other gene promotors that leave the bacterium’s residue in your gut that causes IBD, IBS, Crohn’s, and UC. The statistical increase in digestive diseases and colorectal cancer can be directly traced to the creation of genetically modified foods and the addition of dangerous addictive chemicals in packaged foods. The effects of genetically modified fruits and veggies, factory farmed meats and addictive chemical additives (MSG, high fructose corn syrup, maltodextrin, and others) caused someone to be diagnosed with malignant colon cancer. Factory farmed beef, pork, and poultry come from animals who are cooped up, shot up with steroids, fed GMOs, and given antibiotics daily in their food. In fact, cows fed on GMO corn die in 140-160 days unless slaughtered sooner. Some hamburger producers have started adding ammonia to their beef in order to kill off E.coli. Another site I found reported that long term effects of GMOs haven’t been widely studied yet but short term effects can potentially cause pre-cancerous cell growth in the digestive tract and a damaged immune system. In the first and only raw feeding study, rats would not eat the Flavor-Savor tomato. When they were force fed GMO tomatoes, 7/20 developed stomach lesions, 7/40 died within two weeks and were replaced in the study. Another blog I found shows a direct correlation between the marked increase in the number of people with Crohn’s and Ulcerative Colitis and GMO consumption. For people with digestive diseases and syndromes, these chemicals upset their stomachs, inflame their colons, irritate their bowels and eventually lead to colon cancer. If you total up all of the chemicals off the ingredients labels on the packages of food you eat daily, you may find that you are eating and drinking the equivalent of five to six ounces of chemicals a day. If you drink sugary soft drinks, that number may increase to as many as 20 ounces of some form of chemicals daily. Just imagine pouring yourself a tall glass of chilled chemicals every day and ask yourself what are they doing to your body? If all of this is true, it begs the question of why hasn’t anything been done about it? Why hasn’t anyone written about it in mainstream newspapers? I don’t know if I believe it totally- in my mind, if all of this were true, then wouldn’t everyone have a stomach disease? How can some people be healthy while consuming the same foods that cause another person to be sick? It seems that, if this is true, the only way to avoid eating GMOs is to eat totally organic. However, that is incredibly expensive- getting something at Stop & Shop and buying the same thing at Whole Foods is significantly cheaper. And in the current economy, not many people can afford an organic diet. I am going to wait to see some real, current data before I make up my mind on this debate. However, I am curious- anyone out there eat only organic? If so, have you noticed a major difference in how you feel as compared to when you were eating foods with GMOs?